I recently wrote in my Aggressive Retsuko review about how since coming to Japan I’ve learned a lot more about Sanrio and their cutesy mascots. I’ve also been watching a lot of sillier, cuter and trashier anime lately, so when I heard there was going to be an anime about boys who love Sanrio mascots, I thought it would be hilarious to watch. I have to say, Sanrio Danshi was totally different from my expectations. I thought we’d get lots of silly, cutesy fun, the Sanrio characters maybe acting as the cutesy sidekicks in some kind of magical girl scenario, and a tone not far from Gakuen Babysitters. Instead, I got a BL scenario without the BL, a whole lot of angst and deep-rooted psychological problems, and then a very forced and unconvincing final drama for the characters to overcome. It was a whole lot more grounded in reality than I thought it would be, and commensurately less fun to watch, though certainly it had its cute parts. Basically, it centres on a teenaged boy called Kouta who loves Pompompurin, the dog-flan hybrid thing. Only he’s in denial because he has deep regrets over cruel things he said to a beloved family member before she died. When he discovers two popular boys in the school love My Melody and Hello Kitty, his repressed emotions lead to an outburst, but after confronting all his angst and accepting his true self, he becomes friends with them. They are later joined by two more boys, who stepped right out of BL. Little Twin Stars fan Ryou is a cute, shy, sometimes acerbic blonde boy who was raised in England and likes to watch student council president Seiichiro practice archery. Seiichiro is a huge hulking manly teenager who everyone thinks is perfect, and who likes Cinnamoroll. 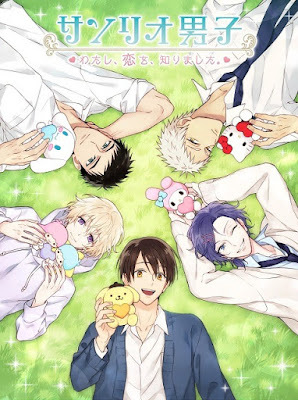 When Ryou’s insecurity makes him lash out of the other Sanrio boys for being girly, the two help each other to a resolution – after various teary misunderstandings – and soon become very close. These two are just like the characters from terrible BL anime Okane ga Nai, only a little less horribly drawn. Most of the series is about these characters confronting their issues. Some are quite interesting, like coming to terms with the death of a family member, or feeling like an outsider who everyone treats like a doll, or having a sister who is basically emotionally abusing you. Others, like being more selfless on the football team, are less gripping. It comes together nicely when the five members finally become friends and go to Puroland together, having a magical time. They decide to put on a play about noblemen from different Sanrio-based kingdoms fighting, basically Meine Liebe with sillier names, which of course everyone will think is magnificent even if it’s incredibly awful. On top of this, some awful subplot about the everyman character getting whiny and violent because he resents being an everyman while everyone else is ‘kira-kira’ (shining brightly) really doesn’t work. The usual lazy Pierrot animation is at play here, and the show looks dated and pretty ugly. I was surprised the Sanrio characters literally stay characters and don’t have any deeper significance or role than a weird mutual interest that causes these characters to come together, at first in hostility (repeated for two separate main characters) and later in mutual understanding. I did like the adorable androgyny of Ryo and the cute straightforward character Kouta has before he has his meltdown, and at the beginning this was a fun, harmless show. But it needed to do more than regurgitate otome game cliché scenarios (down to having a weird first-person scene with the ‘viewer’ before each commercial break) if it wanted to hold the interest. By the end, it was a bit of a chore to watch, even if you like similar cute-boys-doing-cute-things properties. Still, with a manga, game and characters in the franchise not yet introduced (who love Keropii and Batsumaru), perhaps we haven’t seen the last of the Sanrio Danshi.